FitOptiVis uses two sources for requirements: the use cases and the industrial and academic knowledge on the state-of-the-art and current issues. This reduces the risk of reducing the impact of the project by constraining to a limited set of use-cases only. The validation will take results from demonstrators on the use cases and the evaluation against the requirements. The final outcome is a report with the KPI metrics. This work package will achieve OBJ1 of FitOptiVis detailing an image and video-processing pipeline reference architecture building on component abstractions and platform virtualization techniques. To allow combining various component abstractions at system-level, suitable interfaces will be defined exposing the relevant information. A run-time quality and resource management reference framework will be provided that builds on these abstractions and interfaces. Emphasis will be on technology supporting (soft) real-time multi-objective optimisation for performance and energy. System-level concerns like adaptation, (re-)distribution, (re-)configuration and calibration will be taken into account. The architecture will ensure that the image and video pipelines, and the run-time support can work on a heterogeneous edge-to-cloud network of devices and components. This work package provides solutions to the OBJ 2 of FitOptiVis – Design-time support, model driven development. WP3 implements model-based working methodology, involving methods, and tools to predict, simulate and estimate resource usage at design-time. The developed and documented methods, software libraries, reference designs, HW/SW co-design and compilation techniques will improve the resource behaviour of the final system, taking into account the heterogeneous, and changing, structure and resource needs. The development will concentrate on all video/image processing building blocks and models, including hardware IP/accelerators and reference software applications demonstrating generic use of each of these design time resources as base for concrete deployments in WP4, WP5 and WP6. WP3 is building mainly on platforms, tools and design flows resulting from the ALMARVI project. 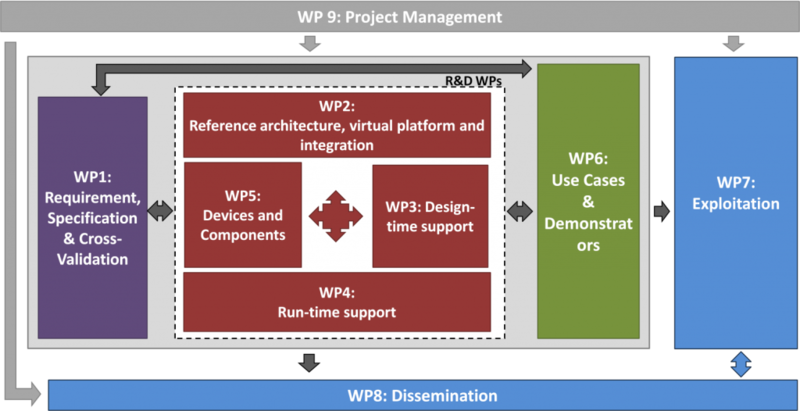 WP3 objective is also to overcome system design complexity, for example, that of the new 16nm heterogeneous device families, and deliver and document design time resources needed to maintain similar design time for the developers in WP4, WP5 and WP6. This work package develops techniques for run-time resource management within the system architecture template outlined in WP2. The objective is to address the complexity of runtime management of applications within a diversity of heterogeneous platform components and configurations. It deals with component realizations and their models that integrate in the system middleware. The components facilitate runtime monitoring, portable software tasks, reconfiguration, redistribution and accompanied optimized runtimes for power-aware task management. It involves solutions for monitoring, measuring components (HW or SW), and implementing algorithms that determine and control the component configurations. The developed task scheduling runtime techniques will take into account multiple constraints and objectives in the execution such as the response latency and power consumption. The goal is to tackle platform diversity complexity and run-time organization. The end goal is to make the diversity and complexity of various platforms transparent from the point of view of the algorithm implementer in order to increase the engineering productivity and to promote compute platform vendor independence. This work package develops and selects hardware and software devices, components and configurations that are best suitable for optimal energy and performance use. Each component will have a FitOptiVis compliant model view and is meant to adhere to the virtual reference platform developed in WP2. Each model may present different levels of abstraction and different set points, depending on its usage, such that the run-time support (WP4) can manage the resources. Low-power hardware suitable for high performance of certain tasks will become part of the system configuration, to improve the resource behaviour. Components and IPs are meant to be developed and/or managed according to the design time techniques developed within WP3 and are meant to constitute the building blocks of FitOptiVis demonstrators (WP6). The development of domain specific demonstrators that show the validity and performance of the FitOptiVis solution and the FitOptiVis alignment with real industrial needs. The identification of the gaps and missing elements that prevent the adoption of the FitOptiVis proposed solutions on actual market solutions. in the development efforts and, in turn the cost of ownership, of CPSs and CPSoSs. This work package has the responsibility to investigate and support the exploitability of the project’s results and to propose realistic exploitation models, to exploit the project’s results to the user community and to protect the IPR of the project partners. Important exploitation goals of the project are the sustainability of our solutions beyond the duration of the project and the use of the project outcomes by stakeholders outside of the consortium. We believe that a successful exploitation of our results is key to the wide-scale uptake of our solutions by the user communities. Dissemination and communication, as a strategically planned process, will start at the outset of the project and will continue throughout its entire lifetime, aiming to promote of the project and its results. Both external dissemination and internal communication between project partners will be covered in this work package. This WP focuses on ensuring that project developments and results will be proactively communicated and disseminated within the consortium itself and to relevant stakeholders, the media and the public. For this purpose, FitOptiVis will develop effective activities that will allow for optimal communication within the Consortium, and the dissemination of information and knowledge generated by the project to relevant stakeholders. Industries, SMEs: These are the industrial partners in the fields covered by the FitOptiVis project. The focus of the dissemination will be to transfer the knowledge generated in the project as soon as possible to interested parties to be applied in the market. As ECSEL is an industry driven programme this will be primary target group. Scientific and technology community: a main action line within the dissemination activities is that of scientific and technological dissemination. The scientific partners in the consortium will heavily contribute to the project’s dissemination activities by presenting the results of the project in well-known and widely read international scientific journals and also by presentations in international scientific conferences, workshops and exhibitions. Contributions to Standardization activities. Results that will be obtained in the FitOptiVis project will encompass both hardware and software layers. Standardization possibilities will be sought actively together with respective standardization bodies and organizations. Open source contributions. The project will utilise and extend, and potentially initiate new open source software and hardware projects which will benefit the field globally by means of providing concrete useful building blocks for future technological advancements. The dissemination effort will provide the means by which to make contact and exchange findings with other research groups working in related fields. It will also give the European researchers, developers and their users a collective voice in discussions over the future. Coordination and daily management of the project, work packages and the consortium, including quality and risk management. Regular progress information will be collected. This WP will act as the primary contact to the ECSEL Joint Undertaking with respect to legal, financial and administrative issues.